U2 was nominated along with Depeche Mode, A-ha, Black Eyed Peas and Razorlight in the 'Best Rock/Pop International' category. The award was won by Depeche Mode. This was the only category with U2 as nominee. Last year U2 opened the Echos with a live performance of 'Get On Your Boots'. The award ceremony took place at the Palais am Funkturm in Berlin, Germany today. We've just refreshed our site dedicated to U2 tours with a modern design and made some additions to the content and usability of the site. Visit the brand new U2gigs.com. The video for U2's new single 'Get On Your Boots' premiered today on U2.com. Follow this links and enjoy. (Reuters/Billboard) -- U2, Kid Rock, Rihanna and Robert Plant and Alison Krauss have joined the performance lineup for the 51st Grammy Awards. The annual recording industry event takes place February 8 at Los Angeles' Staples Center and will be broadcast live on CBS. Previously announced performers on the show include Kenny Chesney, Coldplay, Jennifer Hudson, Jonas Brothers, Paul McCartney, Katy Perry, Radiohead and the combo of hip-hop stars Jay-Z, Lil Wayne, T.I. and Kanye West. (Independent.ie) -- The first U2 album since November 2004 received an exclusive first play in Dublin last night. The Residence private members club on St Stephen's Green in Dublin hosted a playback of the eagerly awaited album. It has been the longest gap between releases in the band's entire career. Media and record company personnel gathered to hear 'No Line on the Horizon' in full in the club's luxurious surroundings. The quartet's 12th studio album will be released in Ireland on February 27, a full weekend before its worldwide release. Sessions for the album were recorded in Fez, Morocco, before moving on to the band's Dublin studio on Hanover Quay, New York's Platinum Sound and Olympic Studios in London. U2 to rescue iconic recording studio? (NME) -- U2 are reportedly considering buying London's Olympic Studios. The Irish band recorded part of their forthcoming album 'No Line On The Horizon' at the historic Barnes studio, which has also been used by Jimi Hendrix, The Beatles, Led Zeppelin and Oasis. Olympic's current owners EMI said in December that the studios weren't making enough money to justify their existence, and put the building on the market. 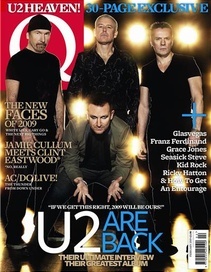 The new issue of Q Magazine hits the shops these days. It features a world exclusive shoot and in depth interviews with each member of U2 on their new album. See Bono let loose with a fire extinguisher, and watch him experiment with a make-up box. Expect to read some dissent in the ranks about the frontman’s activities! The Q website is also hosting a U2 section with exclusive content, video and out-takes from the Q U2 shoot. Click here for more info. (u2.com) -- No Line On The Horizon, the new studio album from U2, will be released on Monday 2nd March 2009. Written and recorded in various locations, No Line On The Horizon is the group’s 12th studio album and is their first release since the 9 million selling album How To Dismantle An Atomic Bomb, released in late 2004. Sessions for No Line On The Horizon began last year in Fez, Morocco, continued in the band’s own studio in Dublin, before moving to New York’s Platinum Sound Recording Studios, and finally being completed at Olympic Studios in London. The album calls on the production talents of long-time collaborators Brian Eno and Danny Lanois, with additional production by Steve Lillywhite.